I think about that verse often… what about “those who have never heard”? How did God clearly show his power and divine nature? Yes, we often say that the beauty of nature, as seen in a sunset or a baby’s first cry, is ample evidence of the existence of God. Is that what this verse means? 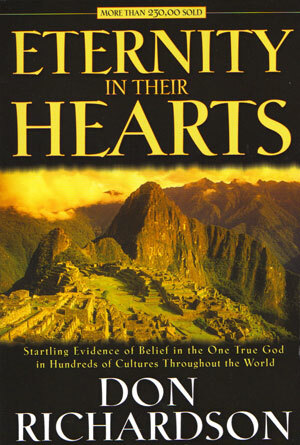 Then I read Eternity in Their Hearts, by Don Richardson*. I realized that God didn’t stop with showing himself in his creation. He placed a part of himself in every people group on earth. It’s up to us to discover where the gospel hides in every culture. It’s absolutely amazing, the “coincidences” that missionaries find on the field. That’s what this book is about.